Monday morning, some local children won’t have a place to go to school. That’s because their school was destroyed by a large structure fire Friday evening. 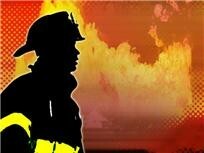 The Guymon Fire Department says the fire was reported in the Guymon Head Start at about 8:49 p.m. The school is located in the back portion of the Primera Iglesia Bautista Church, formally the First Baptist Church. When firefighters arrived, the blaze was already heavily burning. “Flames were already coming out the windows on the first floor and reaching up to the second floor on the outside of the building when we arrived”, said Assistant Fire Chief Grant Wadley. “It took firefighters approximately 50 minutes to gain control of the fire, but not before three classrooms were destroyed by the intense fire. Wadley says the flames were so intense from the fire that the home next door was threatened. Firefighters were able to save that home. Estimated damages caused by the fire are more than $200,000, Wadley said, with extensive structural damage to both the ground and second levels of the building. Fortunately, no one was hurt and no students were at the school at the time of the fire. The fire was first seen by a Head Start school employee who came in after hours to check on items in a classroom. She noticed smoke and smoke alarms going off. The incident remains under investigation and a cause has yet to be determined.